'Devolution' accomplishes things post-apocalyptic stories shouldn't. Here's yet another comic about the world gone mad and it totally works. Rick Remender (Deadly Class, Black Science, Low) has found a way to be innovative and provocative with another dystopian tale that covers new ground as humanity self-destructs again. In a world rife with wars and conflict, the common denominator is determined to be religion. In order to combat that which draws us to believe faithfully, sometimes radically, a serum is created to eliminate our ability to do so. Unfortunately, the serum tests went horribly wrong, subjects began to devolve and mutate causing a contagious virus that spread worldwide. Human and beast began to revert to their prehistorical incarnations. The world has collapsed leaving bloodthirsty tribes and unchanged "sapiens" fighting for survival. Remender avoids being derivative by introducing a much more primordial reality than his other excellent dystopian book, Tokyo Ghost, where culture has devolved into media-consuming zombies. 'Devolution' has homo sapiens-turned-neanderthals in a world gone wild with only a determined woman named Raja seeking a cure. She becomes sidetracked when she comes across a shady sapien settlement that holds her hostage. The backstory that led to this situation is deftly and quickly established in Remender's blunt style. The settlement camp resembles a fort right out of Deliverance with Gil the bully redneck in charge and a Confederate Flag waving in the background. There's an echo of The Walking Dead-type isolation amid the monsters but the fresh characters and setting add a level of intrigue. Jonathan Wayshak has a frenetic sketchy style that gives the book a unique energy, almost a surrealistic approach. Jordan Boyd infuses the environments with subdued colors that seem layered and somehow sullied on purpose to reflect the filthy world being depicted. It's a daring method at illustrating this unpredictable story with unpredictable art. 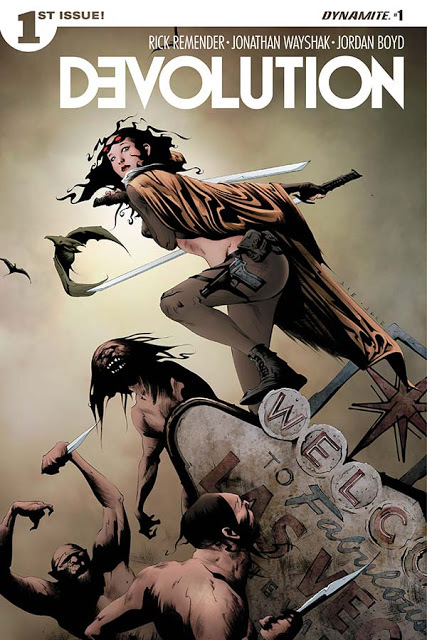 'Devolution' gives Dynamite Entertainment another gem of a limited series. Remender, Wayshak, and Boyd set-up a dirty devolved dystopian future where anything can happen. It's definitely worth getting on board for the ride.